Those of us who live in large cities, as I do, are accustomed to seeing people acting strangely on the sidewalks or in buses. The mumbling woman in the shabby coat clutching two or three tattered shopping bags is given a wide berth. People avoid sitting next to her on the bus or passing too closely on the sidewalk for fear of being subjected to snarling abuse or a rambling, disjointed monologue. Sometimes we recognize mental illness when we see it, but that doesn’t mean that we as a society do much to help those who suffer from it. Recent news stories have reported that roughly half the prisoners held in federal and state prisons have mental health issues and hospital emergency rooms are facing soaring costs for the treatment of psychiatric disorders. The statistics provide a gloomy picture of the state of mental health care in America, but the country has a long history of ignoring or mistreating people with mental disorders. It takes a lot of courage to try to help people who refuse to ask for help and may even turn it down when it is offered. 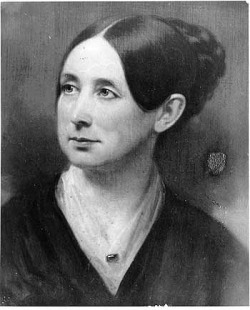 Dorothea Dix is one of the few people who made mental health care her mission. Born in 1802 in Massachusetts, Dorothea Dix had the misfortune to be born to parents who struggled with alcoholism and were often unable to care for their children. Luckily, Dorothea was able to get help from her grandmother, with whom she lived for many years. She grew up to be a thoughtful, responsible young woman and decided to earn a living by teaching school. But school teaching was difficult work and Dorothea’s health was not good. She had to give up teaching and look for other ways of being useful. Like many other 19th century reformers, Dorothea was neither beautiful nor charming. She did not attract suitors and soon realized she would have to make her way on her own. Her poor health limited her choices, but she had enough money to travel to England where she stayed for a year with the Rathbones, a Quaker family involved in the European movement to improve the treatment of insane people. Here was a field in which she could do some good. When she returned to Massachusetts, Dorothea Dix discovered that care of the insane was even worse in America than in many European countries. No one at the time understood the causes of mental illness. People who became violent and delusional were often treated as criminals. Drugs were often used in the hopes of alleviating symptoms, but the drugs were ineffective. Only wealthy people could take care of mentally ill patients in their own home, most working class people and the poor could do nothing for them. Usually, they were placed in jails or boarded with families who were paid to take care of them but usually kept them imprisoned in barns or outbuilding, sometimes tied to the walls or wearing shackles. Dorothea’s hope was to persuade the states to build institutions devoted to the care of the insane so that they would not be placed in prisons. The weapon she used to bring about change was to report on the conditions that she found in every city and town that she visited. There was no supervision of the care of mentally ill patients. Often the people responsible for their care gave them minimal food, never treated their physical illnesses, and let them live in filth without even proper clothing or heat. A quick death was often the only release they had from these intolerable conditions. Dorothea Dix’s report to the state of Massachusetts in 1843, made clear the conditions she had found: “I proceed, Gentlemen, briefly to call your attention to the present state of Insane Persons confined within this Commonwealth, in cages, stalls, pens! Chained, naked, beaten with rods, and lashed into obedience.” Citizens of Massachusetts were shocked to discover how dire conditions were in their state. They authorized the building of an institution where people suffering from mental illness could be cared for humanely. Dix spent the rest of her life trying to bring better health care to other states; she wrote reports; she appeared at legislative hearings; and she drafted legislation. She was one of the early lobbyists fighting for a cause she believed in. Gradually institutions were built in many states to house people who could not take care of themselves. For the 19th century that was a great step forward. If you want to read more about Dorothea Dix, her biography by Helen E. Marshall, Dorothea Dix: Forgotten Samaritan (1937) is still available in many libraries. During the 1950s, psychiatric drugs were discovered and gradually made available. The institutions so carefully designed by Dix and others are not considered the most appropriate way to treat mental illness. The horrific conditions that Dix discovered no longer exist, but our prisons and many of our neighborhoods are still housing people whose lives are made miserable by untreated mental illness. We need a crusader like Dorothea Dix to awaken the conscience of Americans and to ensure that our health plans cover mental as well as physical illnesses. We are a rich country and we can do better than allow so many people to suffer in pain and isolation.